Eco Wind Chimes is now selling American made wind chimes for the Thanksgiving holiday. The Red Himalayan Chime creates a stunning conversation piece as holiday décor or a striking, long-lasting holiday gift. 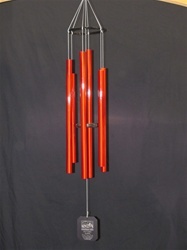 Eco Wind Chimes has a vast array of different wind chime products starting at $30 dollars. Eco Wind Chimes is announcing the company’s wind chimes are available for Thanksgiving delivery. The company has a vast array of different wind chime products starting at $30 dollars and up. All of Eco Wind Chimes’ products are American made and sourced. Eco Wind Chimes features both the Grace Notes and Music of the Spheres wind chime products and the company provides a dedication to customer service.